Be the center of attention with this beautiful Vizcaya dress 89056 that features a lace bodice and a sweetheart neckline that are embellished with an unique lace detail that is adorned with dazzling beads. 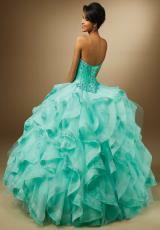 Showcases a full skirt with multiple tiers that make it perfect for your quinceanera or sweet sixteen. Back of dress has a corset lace up that will accentuate your waist along with a lower back zipper.